General Hardy remains alive as of May 2004. 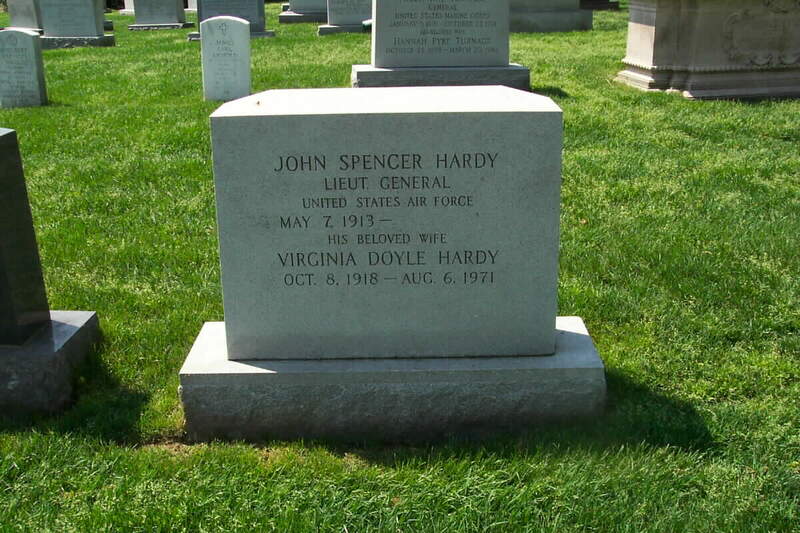 His wife, Virginia Doyle Hardy (8 October 1918-6 August 1971) is buried in this gravesite. Lieutenant General John Spencer Hardy was commandant of the Industrial College of the Armed Forces, the highest level of the nation's military educational system, at Fort Lesley J. McNair, Washington, D.C. He was born in Logansport, Louisiana, in 1913, and graduated from Logansport High School in 1930. He attended Baylor University at Waco, Texas, and Louisiana Polytechnic Institute at Ruston, Louisiana, and in 1938 received a bachelor of arts degree from Centenary College, Shreveport, Louisiana. He entered aviation cadet training at Randolph Field, Texas, in February 1935 and received his pilot wings at Kelly Field, Texas, one year later. After serving on active duty for one year as a flying cadet with the 17th and 3rd Attack Groups, he was commissioned a Second Lieutenant on March 1, 1937, and has been on continuous active duty since. His first commissioned assignment was to Barksdale Field, Shreveport, Louisiana, in squadron and, later, group operational duties. In January 1942 as assistant chief of operations, he helped activate the Eighth Air Force headquarters at Savannah, Ga., and Bolling Field, Washington, D.C. In July 1942 General Hardy moved to England with the Eighth Air Force and served as chief of operations during 1943. For his work during this period of massive airpower buildup in England, General Hardy received the Distinguished Service Medal. With his assignment in January 1944 as chief of operations for the Army Air Forces in the Mediterranean, he participated in the planning for air offensives against Southern Europe, the Balkans, and the Allied landings in Southern France in August 1944. Returning to the United States in late 1944, General Hardy became personnel plans officer and, later, deputy chief of the military personnel division in the Army Air Forces headquarters, Washington, D.C. In August 1947 he entered the second class of the Air War College at Maxwell Air Force Base, Alabama, and after graduating served as deputy chief of staff, personnel, and later, operations, at Fifteenth Air Force Headquarters, Colorado Springs, Colorado. In 1949 General Hardy went to Air Force Headquarters, Washington, D.C., where he was a team chief in the War Plans Division and also on special duty with the Budget Advisory Committee of the Joint Chiefs of Staff. He entered the National War College in August 1950 and graduated in June 1951. He next assumed command of the 43rd Medium Bombardment Wing, 36th Air Division, Fifteenth Air Force at Davis-Monthan Air Force Base, Arizona. In September 1952 he was designated commander of the 36th Air Division. In December 1953 General Hardy became deputy director of military personnel, Headquarters U.S. Air Force. In 1957 he joined the Pacific Air Forces headquarters at Hickam Air Force Base, Hawaii. After serving one year as PACAF deputy chief of staff for plans and operations, he assumed similar duties with the unified command, the commander in chief, Pacific Command. In the latter assignment he was extensively involved in staff actions relating to the Taiwan Straits crisis of 1958 and the renegotiation of the Japanese Defense Treaty the following year. From July 1960 to June 1964, General Hardy was commander of Keesler Technical Training Center, Biloxi, Mississippi, the principal school for radio, radar and electronics instruction in the U.S. Air Force. He next went to England as commander, Third Air Force, with additional duties as chief of the Military Assistance Advisory Group for the United Kingdom. In November 1966 General Hardy was appointed as commander, Allied Air Forces Southern Europe. In August 1968 he assumed duties as commandant of the Industrial College of the Armed Forces at Fort McNair, Washington, D.C.
His military decorations include both Army and Air Force Distinguished Service Medals, Legion of Merit with two oak leaf clusters, Belgian Croix de Guerre with Palm, Royal Hellenic Order of King George I, and Commander with Merit of The Order of the Italian Republic. He is a command pilot with 7,000 hours flying time in military aircraft.